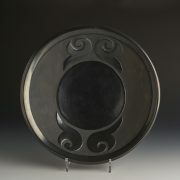 This is the largest platter we have had in our gallery. It is stunning. Debbie explained to me that “all the designs in the middle represent all traditions of the Hopi. Yellow for sun, spots for rain, and the rain for Kivas and our mesa. The bird like end is for all the birds we use here in Hopi. 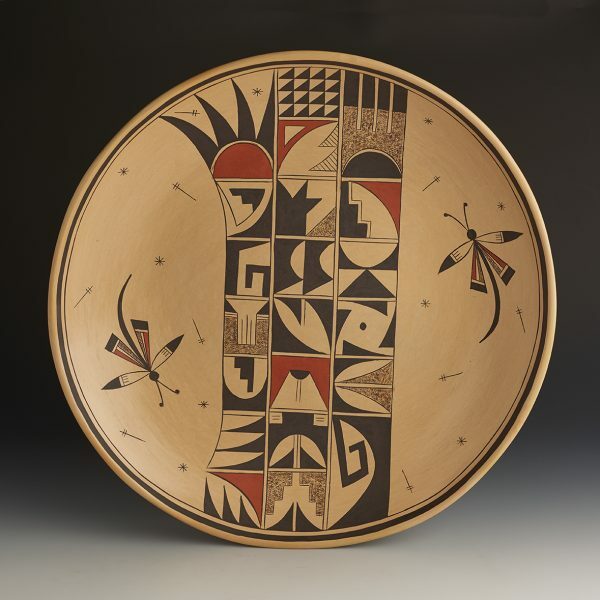 I call the whole design “Night Prayers of the Hopi,” The dragon flies and symbols represent the stars and corn.” So difficult to fire this size plate outside, you can see the firing blue tint elements on the backside of the plate. 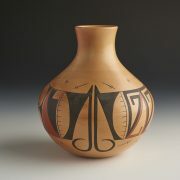 We are so pleased to add Debbie to our group of Hopi potters at NAC. Born in 1969, Debbie is a member of the Hopi-Tewa Tobacco Clan. Her parents are Lorena Clashin and Morris Clashin, Sr. Among her cousins are Dianna and Mark Tahbo, Dorothy Ami and Larson Goldtooth. She says she was exposed to the making of pottery for much of her life but only began to really learn the art herself around 2010, with Dianna Tahbo as her primary teacher. Debbie first showed her work in a juried competition at the Museum of Northern Arizona in Flagstaff during their annual Hopi Show. She earned a 1st Place ribbon at that show and feels it was her tribute to her teacher, Dianna Tahbo. 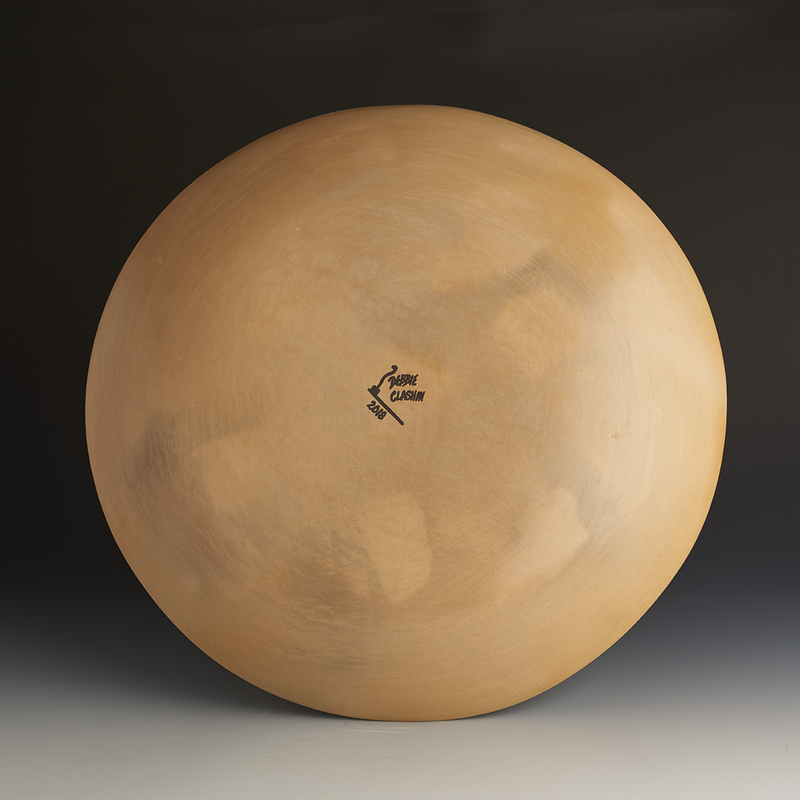 She entered a piece in the SWAIA Santa Fe Indian Market juried show in 2015 and that piki bowl earned her the 1st Place ribbon for Utilitarian Pottery. Some of her favorite shapes to make are large jars with small openings and flattened seed pots. Her favorite designs to paint are stylized interpretations of ancient Hopi designs, especially bird elements. Debby is a traditionalist and continues the tradition of hand coiling with native clays and slips and firing outside.